It has been three months since we started testing "locked mode" in Google Forms for Chromebooks. It has been an exciting opportunity as it promised the possibility of students recording, taking screenshots, or leaving a Google Forms quiz. I've received quite a few mixed reviews during this time. I'm a little late in the game to be posting about the beta version of locked mode, but maybe with this will provide a more honest review. 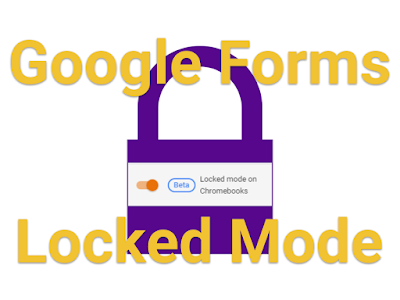 If you haven't tried locked mode in Google Forms, then feel free to check out the video. It is a couple months old, but it will get you started. If you do not have this capability, then your GSuite administrator did not sign up your domain for the early access. Teachers were super excited to pilot locked mode when I first announced it. It was going to help resolve a big problem many secondary teachers were struggling with and that was the issue of cheating. Before you jump to the conclusion that all of the issues were the type of questions teachers were asking, students were doing a lot of copying and pasting of quizzes or taking screenshots and passing them along via Google Drive. Yes, the types of questions (asking questions that students can Google) is sometimes the issue, but that doesn't solve the issue of students copying tests for their friends. Being a beta tester is an emotional roller-coaster. The possibilities peaked the interest of teachers, but the second glitches came their way, it was abandon ship! This reaction is completely understandable. If you're a teacher that likes to tinker, being a beta tester is for you. Trying to figure out how to make a product work in your classroom because you see the potential can be exciting. If you're a bit timid around technology or just want it to work the first time, beta testing can frustrate you faster than the staff member that hogged all the donuts in the teacher's lounge. Teachers found out quickly what it meant as they had trouble getting all students to be able to go into locked mode. They were even more frustrated when there were some teachers that never had trouble at all. So what did we learn from all this? 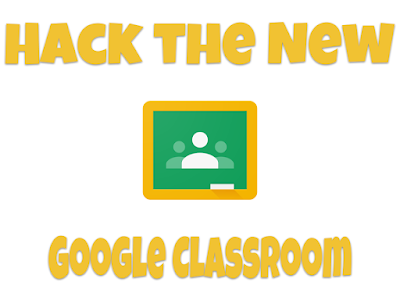 The first tip is for users utilizing Google Classroom. 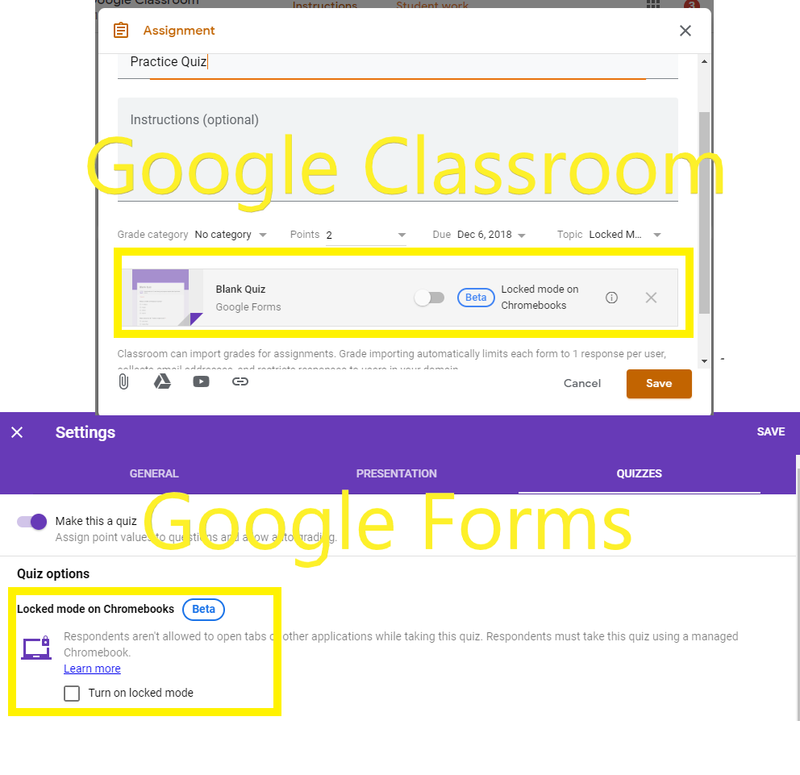 There is a location to turn on locked mode in Google Classroom when you create an assignment and attach the Google Form. For Classroom users, use this button instead of the option in Google Forms in the settings under the quizzes tab. (See image.) Teachers had issues when they attempted to activate it in both the Form and in Google Classroom. Teachers should make it a quiz while building the Google Form, but then turn on the locked mode feature in Google Classroom. The second issue is a glitch usually doesn't become apparent until a student wants to do a screenshot. One of the great features of locked mode is that even screenshots are disabled. The problem is that it will continue to disable screenshots on some devices until the device has been restarted. It makes it appear that the ability to do screenshots is disabled by the domain administrator, but that is merely how locked mode functions. It essentially creates a policy blocking all kinds of features that can be controlled within the Google Admin Console. When locked mode is over, students will find sometimes experience this glitch. My simple advice is to have students restart immediately after completing a Google Forms quiz. If your students change classrooms, their next teacher will greatly appreciate it. 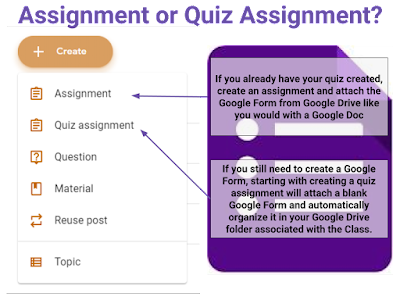 Since the launch of locked mode in Google Forms, Classroom has also popped up with a quiz assignment feature in Google Classroom. 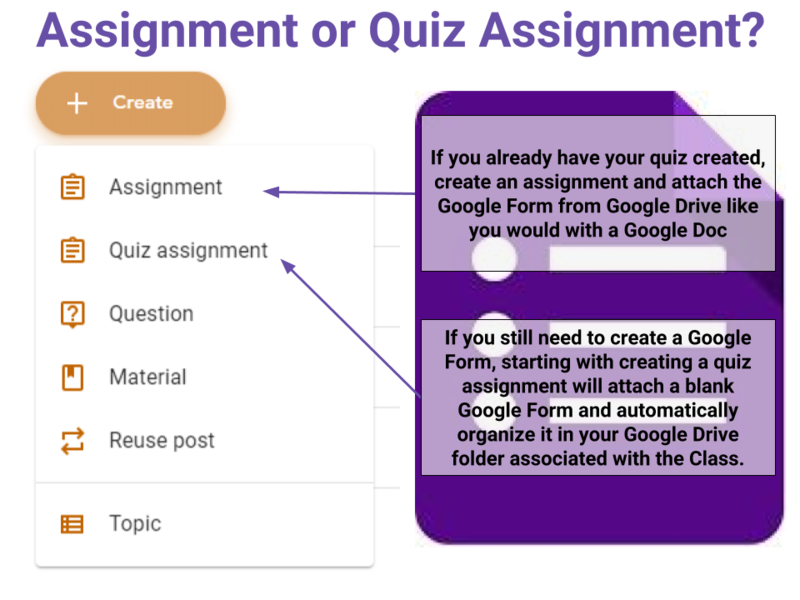 This can cause a little confusion for teachers because if you have a Google Form quiz already created, a regular assignment will suffice. 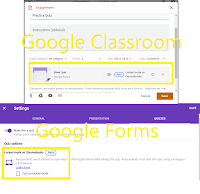 If you don't have one ready to go, Classroom will attach a blank Google Form and place it in your Google Drive folder associated with that class. Overall, teachers have seen a lot of improvement with locked mode. The frustrations I was hearing when it first launched have slowly diminished. While we were having our troubles with locked mode in the beginning, many of my teachers were defaulting to using Securly Classroom to create a walled garden of only specific sites students could visit during a quiz. It worked as a band-aid during the struggle times, but locked mode in Google Forms provides that awesome capability of shutting down all forms of screenshots and completely shutting down access to other websites. If you are new to Google Forms, please feel free to check out some of my other resources linked here. Edgaged.net has been a quite place as of late. I apologize for the lack of posting, but it has certainly been representative of the season in my educational career. We've had a lot of new in the last couple years at MSD of Steuben County. I'll make more of an attempt to post in the future. Just in case I don't hold up to that promise, I'm pretty active on my YouTube channel. Feel free to subscribe to me there. It has been almost an entire year since I came across a quick hack within Google Classroom to save you time an energy when it comes to creating collaborative spaces with Google products (docs, sheets, slides, etc.) To reiterate the linked post, the teacher merely needs to create an assignment, attach a hyperdoc, set the hyperdoc so that students can edit and save it as a draft. By doing so, the teacher can save tons of time due to a cool "reuse" feature within Google Classroom. By reusing the assignment draft and setting it so that new copies of attachments are made, the teacher can protect their template and have all the new copies automatically created and organized in their Google Drive under the "Classroom" folder. The same hack I wrote about a year ago still exists, but the options are in a few different locations and requires an updated video. All of these steps are now accomplished in the new "Classwork" tab and can be simply organized by following several steps. If you're new to creating hyperdocs, I have previous posts on the topic. The main idea is that you give students the opportunity to explore, experiment and share ideas about their learning. With that recipe in mind, you'll have your first template up and ready to roll. All of these tips are merely for workflow purposes. You may want to use the term "draft" so that when you go to make copies it will be easier to locate. Consider having a separate topic just for this collaborative space. This isn't so much for your students, but more for your sanity so that all the groups are in one spot for this task. Lastly, saving the assignment as a draft will ensure that students don't see nor violate the original integrity of your template. Now you're ready for the magic. Click on the "create" icon in the classwork tab again and you'll see the "reuse post" option. You'll then select form the class you are currently in and select your draft that you created. Make sure the small box on the bottom-left corner of this box is selected so that you can create additional copies of the attachments. This is important! By doing so, Google Classroom will create the copies for you and save them in your "Classroom" folder in Google Drive. 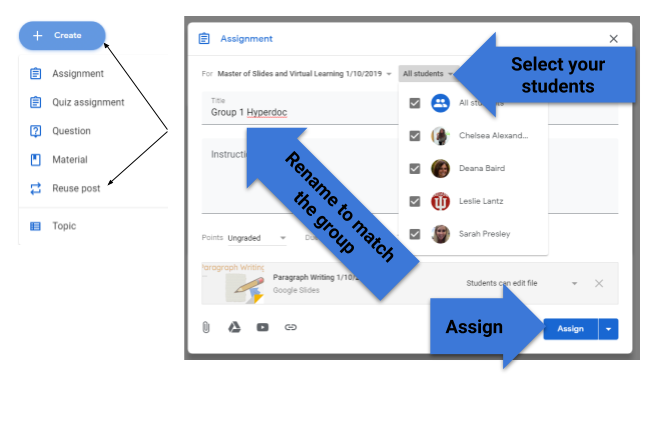 To help with organization, you'll want to change the title of the assignment to the title of the group. This is more for your sanity than the students so that you can keep track of which document belongs to which group. Select your students for the group and assign it! You'll repeat this step for each group in your class. Time and organization are some of the toughest issues of setting up collaborative spaces for students. My hope is that this hack will help you be more efficient and effective in doing so. Map hyperslides? Why do that? I'm a firm believer that technology should not be used unless there is some functional improvement to the task a teacher wants to accomplish. Technology for technology's sake is counter-productive. So when it comes to utilizing tools within GSuite, the tendency is that it becomes a digital worksheet; complete substitution for a paper-pencil activity. I want to combat that when it comes to the creating of hyperdocs or hyperslides. The purpose of a hyperdoc is to increase the level of access and collaboration. We'll explore this thought throughout the post. A member of the social studies department at Angola High School asked me for ideas on how he can change what he is already doing and convert it something the students can accomplish on their Chromebooks. He has tons of blank maps where students have to mark and label various regions based upon historical eras. You can't use Google Maps very well for this activity because it is based upon historical regions that you cannot see on a present-day map and quite frankly there are a ton of historical maps that already exist online. Despite those arguments, I take the stance that students need to be accomplishing a hands-on, creative task in order to lock important information in their brain. I also think it is important that students know how to use their Google tools in order to accomplish unusual tasks from time to time. Creative uses outside the norm will hopefully transfer over into future classwork. There were also a couple of other thoughts I had as my colleague was reaching out for ideas. First, I thought making maps on the Chromebook would not be worthwhile because it would not be time efficient. Second, there wouldn't be a whole lot of functional improvement and we are borderline using technology for technology's sake. Regardless, I came up with some ideas on how it could be accomplished and make it worthwhile. I'll share my thought process when I'm in hyperdocs mode next. What's up with the hyperdoc? I'm going to take a detour for a moment; please hang with me. How will the organization within a hyperdoc help guide as opposed to creating confusion? Is it necessary to give a link to the entire resource or just a single page? Can you get away with a screenshot of the portion you need? (Cited of course.) The less traveling around on the screen the better. How are you going to break the information up so that it meets the needs of your students? What are you asking the students to do with the information? Are you asking questions that they can answer with a simple Google search or require them to construct a response with the various resources you provided? Will they need to provide their own links to resources? Is the response easily integrated into the hyperdoc? If you are requiring video, a hyperdoc via Google Slides might be more appropriate as they can insert a video directly into the presentation. If you are requiring a text response, are you giving them a table to work in so that it doesn't destroy the formatting of the rest of your hyperdoc? If they need to combine images and text to construct a response, the built-in Google Drawings in Google Docs or a single Google Slide will work wonders. How will you have students collaborate? Students have great ideas and we need to harness that. Are the questions you're asking good enough that students may need to bounce ideas off of one another in order to get the most of the learning experience? Are you going to have students share the document with one another or merely sit side-by-side and chat? Will you set up the entire document to be a collaboration space for groups of students to respond? If you are doing the later, make sure you check out my post on how to hack collaborative hyperdocs in Google Classroom. As you build and implement hyperdocs, you'll get a feel for what is effective in the layout and implementation of hyperdocs. Now, let's get back to my story. When creating a hyperdoc in a map format for my friend in the social studies department, I decided that a Google Slides presentation would be my best option. 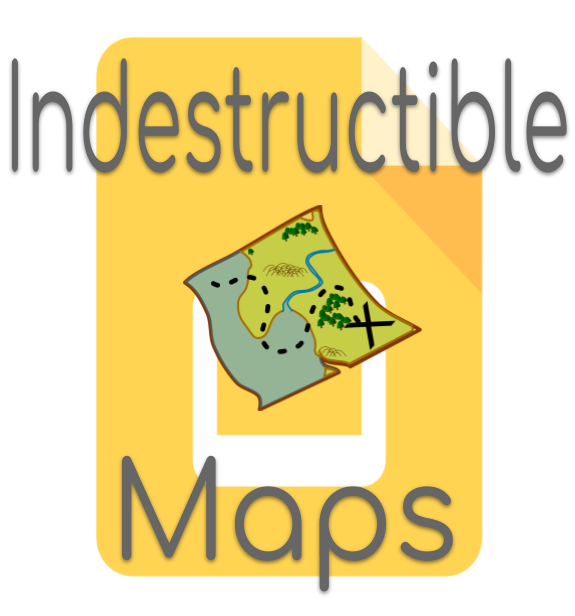 I also decided that I needed to make it "indestructible" so that students cannot move around the original map. I merely want them using the shape, line, and text tools over the top of the map without the trouble of the map getting moved. Also by making it an indestructible hyperdoc, a student could accidentally remove Slides and the templates are completely recoverable. 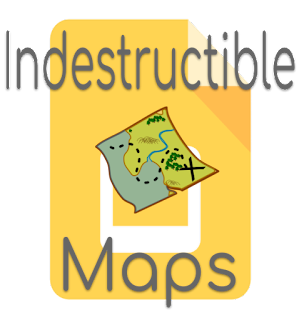 If you aren't familiar with creating an indestructible hyperdoc by editing the master in Google Slides, feel free to check out my video. The other issue I thought about is that the students will not be familiar with using Google Slides to mark up a map. It is an awesome idea, but how can you quickly train the students to utilize the polyline tool, add custom colors, and provide hyperlinks to resources all within the map? For this, I created a second video and sent it to my colleague. He took my student map tutorial and placed it in the assignment in Google Classroom. If you choose to insert a map in your hyperdocs, feel free to use my demonstration video below as a resource. So what about collaboration? That was the fourth question I asked previously about hyperdocs. Do students need to talk about what they are learning? Yes, as long as learning is the focus of the assignment and not a traditional grade. A simple way to accomplish this would be to create small groups, provide multiple maps that are needed in the hyperslides. They could be all the same map and the students could focus on different aspects or even several different regions. Each map could be on a separate slide in the same Slides presentation. All the while students have access to the group's work and can comment and make suggestions, or speak orally during group meeting time. However, I encourage the comment feature so that teachers can access the document and view the feedback. Teachers are not omnipresent and may have other groups to tend to while and still need to check in on another group's progress. 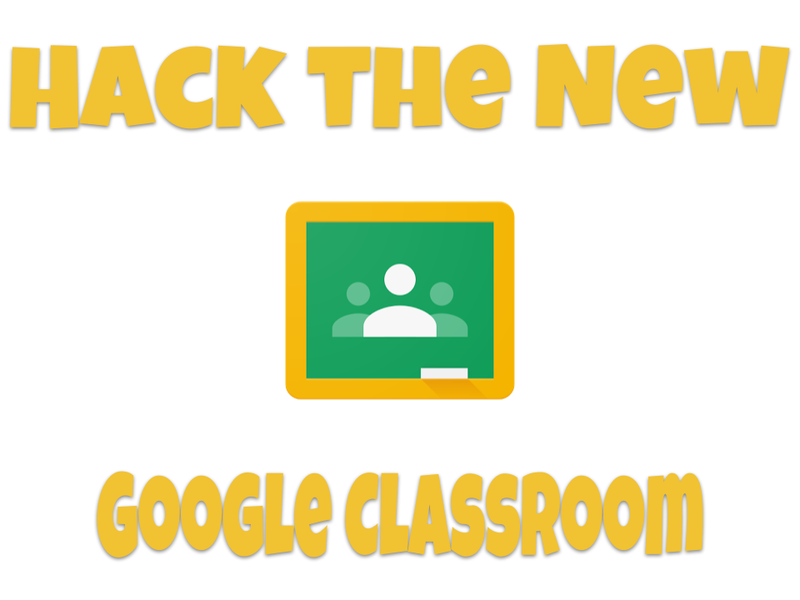 If you aren't sure how on the setup of these groups within Google Classroom, please check my Google Classroom hack that I linked previously for more information. 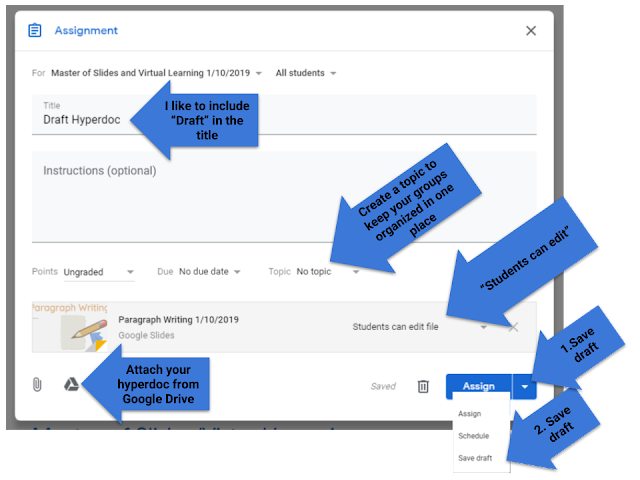 It will guide you through the process of selecting students and utilizing the "reuse post" feature in order to not have to make tons of copies in Google Drive. It saves a ton of time! If you're still reading at this point, I hope I've challenged your ideas on how to build hyperdocs. The digital environment is just as important to the learning experience as the physical one. Hyperdocs can be fun and exciting. They won't be if they merely replace a worksheet.